If you haven’t seen the work of Leopold and Rudolf Blaschka, you need to check it out. The were the father and son team from Czechoslovakia, known as Bohemia when they were alive, that created the most wonderful replicas of botanical and sea specimens. Their work is is in museums including Corning and at Harvaard. 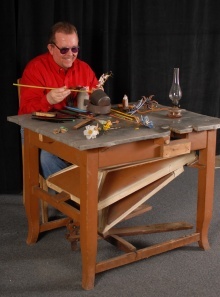 The Museum at Corning has a Blaschka era lamp working station, table and torch, that they have on display so you can see what was used to create their amazing work. Check it out over at Corning’s web site. Send me more. Lamp glass.